Freezing rain fell throughout the St. Louis area early Sunday morning, leaving local roadways covered with ice and driving conditions treacherous. There were several reports of vehicles off the roadway in Monroe County, one involving an ambulance. At about 6 a.m., the Columbia Fire Department and Monroe County Sheriff’s Department assisted Columbia EMS in responding to an overturned MedStar ambulance carrying an injured patient on Route 3 northbound near FF Road. 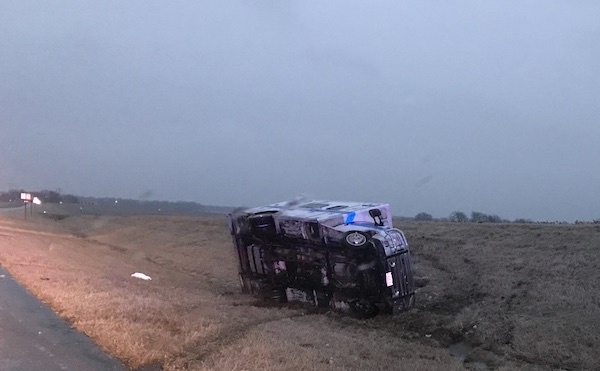 The MedStar ambulance was transporting a patient who was involved in an earlier crash in Randolph County to a St. Louis hospital when it lost control on the ice and overturned. MedStar paramedic Nick Koester sustained a concussion in the crash, requiring Columbia EMS to transport both the originally injured patient and Koester to a St. Louis hospital for treatment of non-life-threatening injuries. “We had a hard time getting to the scene with our fire truck,” Columbia Assistant Fire Chief Jim Broshears said. Shortly after 7:15 a.m. in south St. Louis County, a Columbia EMS ambulance returning from Mercy Hospital South slid off the icy roadway at Tesson Ferry Road and Interstate 270 on the southbound ramp. The crew was not injured and no patient was onboard at the time of the incident, nor did the ambulance sustain any damage. Freezing rain continued throughout the morning before tapering off around noon, after which temperatures rose to above freezing.